Hi! My name is Lynn. I know when looking for a photographer to capture your memories you want to make sure you are comfortable with the person that will be behind the camera. This is especially important for newborn photography, as you are trusting me to take care of your new baby. I don’t know if reading something on a website can make you feel like you know someone … but I will try. I am married and I have 2 amazing children. I grew up with a camera in my hands, traveling across country with my mother, photographing everything we could find. When I became a mother I found a new passion for this “hobby”. I wanted to help other parents capture the tiniest features of their new human in the most beautiful way I could. Safety is my number one concern during newborn photography sessions. 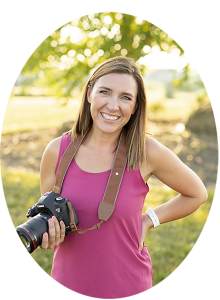 Each year I attend at least one in person workshop with other newborn photographers as well as several online classes to be on top of my safety techniques. I never want a mom or dad to be concerned with a position that baby is in or that they may be in an unstable prop. I focus mostly on natural colors and minimize props however if mom or dad have something important to them that they want incorporated into the session, I will work my hardest to make their wishes come true. I have been named one of Columbus’ top newborn photographers by Expertise.com for the past 4 years and I strive to continue to make this list in the future. While I specialize in maternity through one year of age, I am also available for family photography and have found a new love for senior photography. I hold newborn through one year sessions in studio, and maternity, family and senior sessions on location. As well as newborn photography, I also offer milestones, baby, family and senior portraits. Thank you for checking out my work and I hope to help memories with you and your family soon!